On March 8th, members of DSA SF’s Socialist Feminist working group joined a coalition of organizations at San Francisco’s Civic Center to celebrate International Women’s Day. Together we made ourselves loud and clear, wearing our red, waving our signs and being unapologetically vocal about women, LGBTQI, immigrant, people of color and people with disabilities and special needs’ rights. Those who gave impassioned speeches were from the Moms Demand Action for Gun Sense, NARAL – Pro Choice America, the Senior and Disability Action, the Queer Cultural Center, CA Domestic Worker’s Coalition, California Faculty Association, GABRIELA, Global Women’s Strike, United Educators San Francisco, Housing Rights Committee, the SF Tenants Union and Worker’s Voice/La Voz de los Trabajadores. Our Socialist Feminist group was there for several reasons. For one, International Women’s Day is rooted in socialist feminism. In 1909, female garment workers in New York City, including young teenagers and immigrants, staged a 20,000-person strike demanding better working rights. And hint, hint—they won! Inspired by the victory, the Socialist Party established “Women’s Day” marches in 1910 across the United States. In order to continue to dismantle oppressive structures of power that keep women down, outreach and coalition building with our sisters and allies at events like these is key. 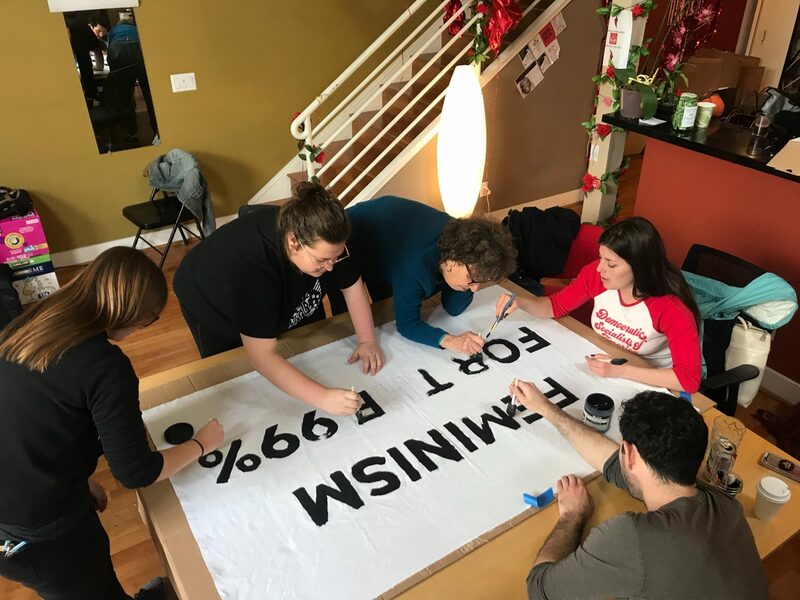 We’ve started partnering with organizations and creating events, such as the counter-protest to the March for Life in San Francisco this past January with Bay Area Reproductive Justice. Our work is intersectional and has just begun; we’re currently working on projects and goals focusing on immigrant rights, reproductive justice and homelessness. Those who are interested in getting involved (with priority given to folks who identify as women) are welcome to reach out via email (socfem@dsasf.org) or attend our next meeting at the DSA SF office (3/17, 2-4pm at 350 Alabama St). We hope to see you there in solidarity! The coalition organizing this event included the IWS National Committee and March 8th, Bay Area for Reproductive Justice, Democratic Socialists of America: San Francisco, International Socialist Organization: Northern California, Refuse Fascism Bay Area, Women’s March San Francisco, and Worker’s Voice/La Voz de los Trabajadores.